Don't get this article wrong. I am a former seminarian, a devout Catholic, a faithful of the Roman Catholic Church and knows very well what excommunication means. This is not to encourage anyone not to go to mass during Sundays, but a plea to take note of existing concerns. 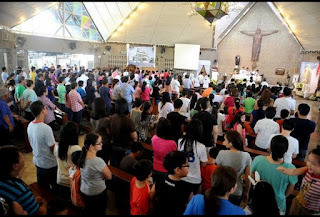 These are just observations of a Filipino layman experiencing the rite of the Holy Mass. Spanish conquistadors brought to the country Catholicism, which spread naturally as the colonial reach of Spain got established in the Philippines. 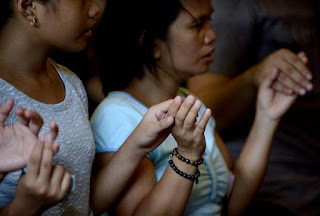 These hundreds of years under the Spanish rule cultivated the Christian virtues to Filipinos, reaching almost every inhabited island, which is still evident nowadays just by looking at the number of churches erected. Religion is a very important facet of our identity, and a very compelling aspect of our lives. The language used in Catholic rites before Filipinos were allowed to become priests was Latin. It had that mysterious appeal, a "holier" feel on things. Upon the arrival of the Americans, the rites were translated into English, then eventually became Filipino. Throughout these eras, enough attention was given to ensure participation of the lay people booklets or guides so we can follow and respond. Honestly, a lot of people nowadays feel alienated when attending mass. So what are the obvious discomfort? One, there were changes in the cues and responses throughout the celebration as reported by GMA Network. Change is good, as it is a universal fact that the only thing constant is change. At one point or another, things are really going to evolve. But with modifications, support has to be there so participative individuals can keep up. Apparently, this has been overlooked. When I was young, the whole text of the mass is projected on a wall near the priest so that everyone can follow. That was great help. But for the sake of those with poor eyesight, missalettes are printed out and given away as free before the mass starts. Obviously cost-cutting measures have been implemented because people rarely get misalette copies presently. Two, still on the changes. According to the National Catholic Reporter, many people find the words too intimidating. Some are seemingly too complex, both for non-Catholics and the Catholics. On the New Apostle's Creed, the words "was incarnate" and "cosubstantiate" are jargons, and the whole prayer seemed heavy and difficult overall. Of course, through recitation and familiarization, it will not be as bad in the long run. The problem is, where is the support to help the lay people keep up? Three, the choirs and the songs. Frustrated musicians and composers must have joined the ranks of the service. Its a noble deed, in fact, everyone should be thankful they're rendering their talent and resources to make the liturgical celebration worthwhile, only a lot of them must have overdone it. Has anyone noticed that when you sing The Lord's Prayer, there are probably a thousand versions and permutations to its musical accompaniment and way of singing? People had been tinkering with it and modifying it as they please. Every church you go to has their own version, or much worse, every batch of choir in every church has their own favorite version. Same thing goes with the other "singable" part of the mass. During the Opening hymn, the Offertory, Communion and the Closing Hymn, no one sings anymore because the choir have their best selection being played and are trying to make it a mini-concert of their own. Now how can the participants of the mass "participate" with that going on? What happened to the old church songs that are soulful and inspirational, yet simple and very relevant to the faithful? Participation has been very important, especially for me. To be able to partake in a community of faithful is essential. One hour every week is all the chance we get to fulfill our religious obligations. While most want to make it count, the feeling of alienation prevents many from getting involved. The faithful merely becomes an audience, not a participant. Inspite of being physically present at the church, a passive "audience" is a distracted and bored one. We go to church to be able to sing, pray, respond and participate and get involved in the Holy Mass.